Being diagnosed with diabetes usually means you have to watch your blood sugar, mainly through diet, exercise, and medication. However, diabetes can cause a variety of complications throughout the entire body—but how? The answer is the circulatory system. The circulatory system is responsible for the transportation of blood throughout the body, providing nutrients and oxygen to cells, as well as transporting waste and carbon dioxide away from them. When the body begins producing and retaining too much glucose (blood sugar), the substance is not isolated to one sector of the body. The circulatory system pushes and pulls the glucose throughout the entirety of the body via the blood. The excessive amounts of sugar cause damage to blood vessels and the organs that are associated with those vessels suffer the consequences. One of the organs that most severely feels the effects of diabetes is the heart. Simply being diagnosed with diabetes dramatically raises a patient’s chances of encountering heart disease. The chances of getting heart disease at a younger age than most, as well as the severity of the heart disease itself, are increased when diabetes enters a patient’s life. As the vessels supplying blood to the heart become damaged, clogged, or hardened by the high presence of glucose, the heart’s ability to receive (and therefore send out) blood is negatively affected. Types of heart disease that are specific to diabetes are Coronary Heart Disease (a buildup of a substance called “plaque” in the arteries), Heart Failure (when the heart is unable to pump the necessary amount of blood), and Diabetic Cardiomyopathy (a disease that damages the actual function and structure of the heart). Another major organ that suffers damage from diabetes is the brain. The brain thrives on oxygen-rich blood in order to function, and when the blood vessels that provide the blood are affected by excessive glucose, very serious complications can occur. When a vessel responsible for providing blood to the brain closes off or bursts, that part of the brain will become oxygen-deprived, and the cells will die. This can result in speech impairments, vision problems, and mobility issues, including paralysis. 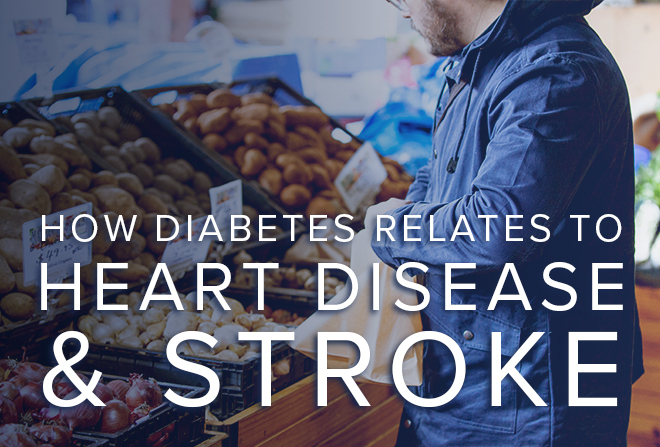 Like heart disease, being diagnosed with diabetes can significantly raise your chances of stroke. We know the struggles that patients encounter as they work to regain lost abilities, and our goal is to help those patients overcome them. We feel it is also our responsibility, however, to educate our community about the causes of these conditions, in the hopes of preventing them. We will continue to explore the topic of diabetes and circulation in our next post, as we learn about lifestyle changes and management techniques that may help patients cope with (and even prevent) these complications. As the sun begins to beat heavily down during the summer, people start turning to the relief of cool swimming pools and refreshing lakes for recreation. During the summer months, carefree attitudes coupled with the increasing need to stay cool contribute to a major spike in diving-related SCIs. In a study highlighted by the NCBI, 88% of diving-related cervical spine injuries examined occurred in the summertime, and 97% were sustained by healthy young men (under the age of 27). The cervical section of the spine is comprised of seven vertebrae that connect the base of the head to the trunk and shoulders… making the informal term for a cervical spine injury a “broken neck.” The results of these injuries can be devastating. Spinal cord damage can cause partial paralysis, complete paralysis, and death. Shallow water: Water depth can be deceptive. 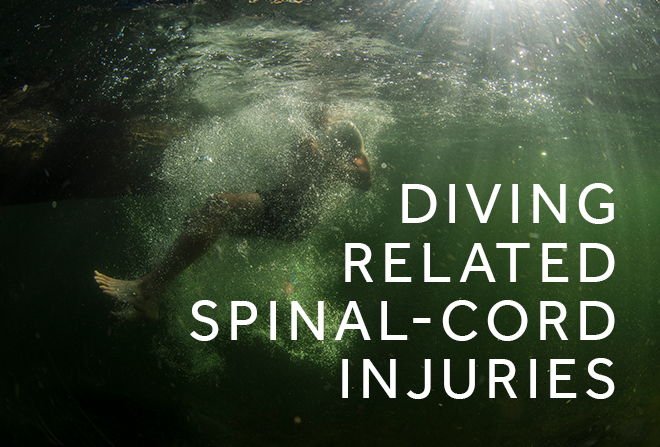 Blindly diving into water that has not been previously examined can result in the diver striking the bottom head-first, causing great damage to the vertebrae. Above-ground, personal pools are notoriously shallow and known for causing many a diving accident. Obstructions in lakes, rivers, and ponds: Natural bodies of water are rarely crystal clear, and are extremely susceptible to debris accumulation. Tree trunks, rocks, and man-made items such as tires are commonly found under the water, but seldom seen above it. Natural landscape changes: While the ocean may seem like a wide, open opportunity for diving, the fact is that it can be just as hazardous as a murky pond. The ever-changing tide and forceful waves are capable of shifting the layout of ocean sands, causing sandbars to crop up where they previously weren’t. Diving head-first into solid sand can yield traumatic results similar to that of diving into solid concrete. Explore and examine: Never dive blindly into any body of water… be it pond, ocean, lake, or swimming pool. Hazards may be lurking beneath the surface, or the designated diving section might be smaller than you anticipated. Avoid alcohol: Summer often brings with it carefree attitudes and rowdy get-togethers where alcohol is commonly involved. Diving hazards are to be taken seriously, and substances like alcohol often remove the ability to discern the difference between safety and recklessness. Own responsibly: If you own a personal pool, you are responsible for the safety of the people using it. Ensure that depths are marked properly and that safety rules are clearly stated and posted. Educate: Water-safety should be included in any child’s education, and diving is a topic that should not be neglected. Make it a point to teach children of possible diving hazards as well as the serious consequences of ignoring safety. Be repetitive and firm in your instruction. A commonality in diving-related injuries is that they are often suffered by young people who are otherwise strong and healthy. A vibrant future can be altered dramatically by one single dive. Equipping yourself with knowledge and awareness can ensure that you spend your summer enjoying yourself rather than spending it in recovery. So many fun things happen during the summer, and traveling is one of them. Whether you’re going to a summer camp, a family reunion, or vacation someone is inevitably bound to forget a swimsuit or toothbrush, or a favorite stuffed animals are left by the door. These situations can be disappointing but rarely do they completely unravel someone’s plans. This is not the case, however, when a travel hitch involves your diabetes. If you’re not properly prepared, a diabetic travel complication can range from, at the very least, a huge inconvenience, to, at worst, a life-threatening situation. By developing a travel checklist that utilizes a few of these helpful tips, you’ll be able to minimize your risk of a diabetes-related travel disruption. Talk to your doctor. If you are planning a long trip, especially one by air, it’s crucial to have a discussion and schedule an appointment with your doctor. This will give you both a better picture of your current diabetic health, the chance to get any needed immunizations, and a critical travel letter describing your diabetes plan. While this letter is not required by US Airport Security, it can be extremely helpful should questions or a need for documentation arise. The letter should include your diabetes treatment plan, a list of prescriptions, and a description of the supplies required for your diabetic care. Research your destination. When traveling with diabetes, a little research can bring great peace of mind. If you’re heading to another country, finding a hospital or doctor who speaks a language you are fluent in can save you from a lot of headaches. Learning key phrases in the country’s language, such as “I have diabetes,” or “sugar or juice, please” can be very helpful in an emergency. For more information on an emergency abroad, please click here to visit the International Association for Medical Assistance to Travelers page containing useful phone numbers and resources. Don’t forget your documentation. Not only is it important to bring a detailed travel letter from your physician, you should also make sure to pack a prescription for insulin or diabetes pills, should you encounter an emergency. In addition to these two pieces of paper, your medical ID is essential. By wearing one as a bracelet or necklace, you eliminate any possibility of leaving your information in a hotel room or briefcase. In an emergency, physicians can learn about your diabetes, allergies, and insulin needs so that they may properly treat your symptoms. Keep your supplies close. You should pack a diabetes kit containing all of the supplies you need on a regular basis, and pack it in a carry-on. Never check your diabetes supplies with the rest of your luggage. The cargo hold is not equipped to keep a proper temperature, and you run the risk of being separated from your baggage, which could be devastating. Packing at least twice the amount of needed medications and supplies is also a good idea. Contact the airline a few days prior to your flight. This is a great time to clarify insulin/supply rules, and to request a meal that is friendly to your needs. Remember: Eastward travel means you will “lose” time, so less insulin may be needed. Westward travel “gains” time, often requiring more insulin. Allow yourself a period of rest after you arrive at your destination; this will allow you time to recover after the flight and settle yourself with your medication needs and changing routine. Check your glucose often; new routines, foods, and environments can throw off your insulin levels, and it’s important to stay on top of them. Pack airline-approved snacks. This way, you can help control your levels without too much fuss or inconvenience. 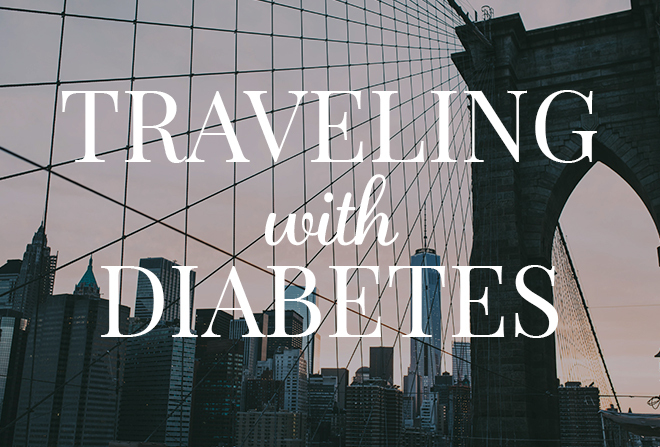 Diabetes isn’t something that should keep you from traveling. Even with this disease, you can enjoy a much-needed vacation or expertly handle an important business trip—as long as you employ some thoughtful planning and deliberate preparation. As the sun begins to stay out later and we shift our gears to summer, there are going to be more opportunities to get outside and enjoy the weather. The increase in outdoor activities, however, does bring with it an increase in sun exposure. The risk of sunburn, dehydration, and heat stroke become real dangers as we move our lives out of our homes and into the heat, and it’s important to be prepared for and aware of the warning signs. We would like to remind our readers of some of the symptoms to watch out for, as well as talk about dehydration. Heat exhaustion can happen after extended exposure to high heat, and, if untreated, can lead to heat stroke, which can have very serious complications. Heat stroke occurs when the body loses its ability to cool itself and requires emergency attention. Another condition that goes hand-in-hand with heat exhaustion is dehydration. Like both heat stroke and heat exhaustion, this is a condition that can be particularly dangerous for small children and the elderly. Some of the symptoms are the same, as well as methods of prevention. By keeping yourself hydrated when out and about in the heat, you’ll be one step closer to avoiding dehydration. It’s a good idea, however, to know what to look for, even if you feel prepared. If you or someone you are with is displaying symptoms of heat exhaustion or dehydration, it’s time to get indoors to cool off and drink some fluids. If symptoms of heat stroke are apparent, it’s time for the emergency room. With a little preparation and some heightened awareness, you’ll be able to enjoyably and safely experience all the outdoor fun this summer. There are many things to love about summer, from activities like camping and cooking out, to hanging out with family in the great outdoors. But it also exposes us to a wide variety of potential burns that we can take lightly if we’re not careful. 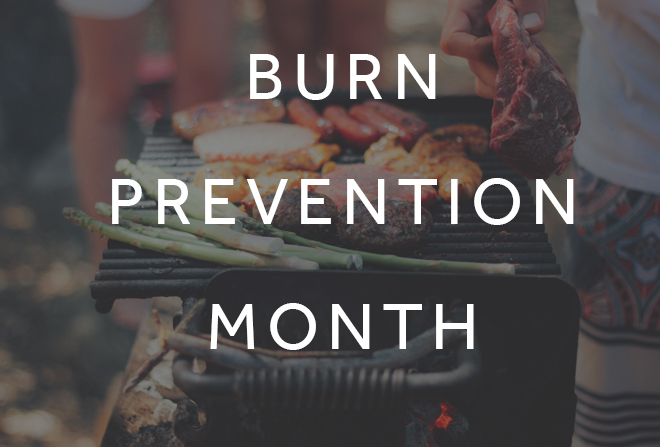 Here are some of summer’s burn hazards, and preventative measures that can keep your risk of injury low. Enjoying the sunshine is just part of any typical summer day. Over-exposure to sun is a serious issue, however, especially when you consider its potential short- and long-term effects. When the amount of exposure to the sun exceeds the ability of the body’s pigment (melanin) to protect the skin, sunburn occurs. The sun’s ultraviolet rays can cause serious damage to the skin. You can even get sunburned on a cloudy day, because the majority of ultraviolet rays can pass through light clouds and haze. 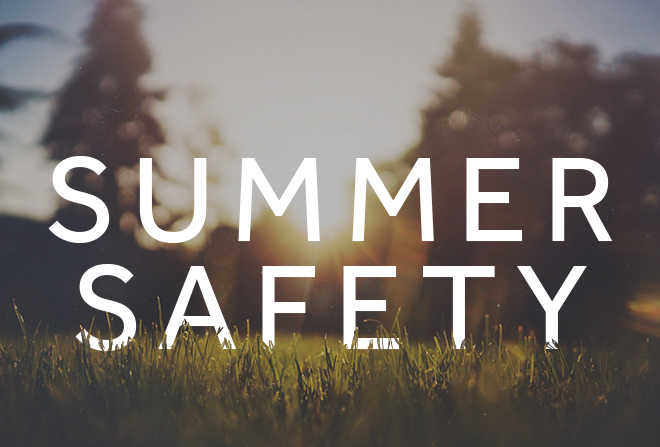 To avoid sunburn, select shaded areas – whenever possible – for outdoor activities, and wear protective clothing such as wide-brimmed hats and long-sleeved shirts. When it comes to sunscreen, use products that have a Sun Protection Factor (SPF) of at least 15, and have both UVA and UVB protection. It’s equally important to protect your eyes from the harmful effects of over-exposure to UV rays. Sun damage can lead to serious eye problems later in life. Protect your eyes with UV-blocking sunglasses and wear hats with wide brims. Wraparound sunglasses provide further protection by keeping light from entering the corners of your eyes. Infants and young children are at a greater risk of suffering sunburn because their skin is thinner than adults. Babies less than one year old should be kept out of direct sunlight, and should always be dressed in protective clothing such as long pants, long-sleeved shirts, and wide-brim hats. Choose a tent made of flame-retardant fabric. Build your campfire downwind and at a good distance from your tent. Always have an extinguisher tool, such as a shovel, bucket of water, or fire extinguisher, on hand. Never use heat-producing appliances (such as cooking appliances or heater) inside your tent. Never add a flammable liquid to a fire or hot coals. Always have adult supervision of children around the fire. Only adults should handle fireworks. While sparklers and other backyard fireworks might seem harmless, small children should never be allowed to handle them. Never try to re-light fireworks that don’t work. Soak them with water instead. Always have a bucket of water or fire extinguisher handy. Be sure to light fireworks out of range of spectators. Light fireworks on smooth, flat surfaces away from houses and flammable material. Never place your body or face over fireworks. Whether you’re using a gas or charcoal grill, cooking out increases your risk of fire and potential burns. Gas grills have been linked to over 7,000 fires per year, but charcoal grills have potential fire risks, as well. The ease of cooking with a propane grill makes it a very popular form of barbecuing. Propane is a flammable gas and should be handled accordingly, however. Propane grilling accidents tend to happen when the grill is left unattended, or just after the gas cylinder has been refilled and reattached. Be sure to check all of grill’s connections for leaks by spraying soapy water on them. If bubbles arise, then there’s a leak and you should turn off the tank valve and tighten connections. Also, never start a gas grill with the lid closed, as gas can accumulate inside when not in use. When using a charcoal grill, never use gasoline as a starter fluid. When using regular starter fluid, let the fluid set for a minute before lighting the coals as this allows the heavy concentration of vapors to disperse. And always place the container of fluid far away from the coals before starting before starting the fire. Last week we learned about a patient who had Aphasia, and what it was like for him and his family. Each patient is different when it comes to rehabilitation, but every patient can benefit from a family member that is aware of their condition. Aphasia Awareness Month is the perfect time to learn more about this condition. When a patient experiences damage to the parts of the brain where language occurs, we call this “aphasia.” Aphasia can cause a person to lose their abilities to process language, be it in expression or comprehension. Most often, the left side of the brain is the one responsible for aphasia and causes the affected person to encounter difficulties with speech and comprehension. Many of our aphasia patients are stroke survivors. Although things like brain tumors and traumatic brain injury can also be responsible, stroke is most-often the culprit for the language struggles that we help our patients work through. Patients with aphasia often display issues with both comprehension and expression. When most of the problems lie in the comprehension or reception of language, this is often classified as “Wernicke’s Aphasia.” While a sufferer can sometimes pick up on the melody or cadence of a sentence (determining if it’s a command or question, for example), they might have problems understanding the specific words that are being said. Since a person’s vocabulary is housed in the left side of the brain, understanding of words can sometimes be affected, as well as the concept of stringing words together to form a full thought. The range of symptoms that can occur during aphasia is wide and varied, but the factor that stays constant is a need of support. Through the support of family members, friends, and rehabilitative therapists, a person suffering from aphasia has a better chance of getting back on the road to understanding and function. The word “aphasia” can be intimidating. While it is definitely a serious condition, it is one that can be worked with and, to some degrees, overcome. Recognize… that aphasia has not affected the patient’s intelligence. It has altered their ability to communicate and understand language, but their personality, memories, and knowledge remains. Remembering that the same person you’ve always known resides behind this communication disorder can be grounding and encouraging. Take the time… to learn your suffering family member’s struggles and specific communicative needs. After a period of routine, you’ll be able to discern how to understand and communicate with your loved one, bringing a sense of comfort and progress to the both of you. Create… an environment that is conducive to focus and treatment. When a person has difficulty understanding the simplest of words, even the simplest of distractions can be a deterrent to progress. 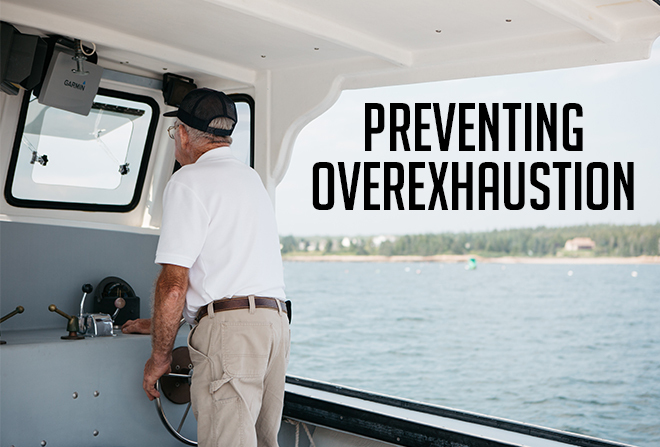 Eliminate extra sounds and excessive visual stimulations, so that your loved one can focus on the task at hand. Simplifying your questions to yes/no and slowing down your rate of speech can encourage success. Explore… different methods of therapy. Sometimes drawing, writing, and even the encouragement of socialization can stimulate progress in a stroke survivor’s language. It is important to keep communication with your loved one’s therapist open so that you can learn about techniques that may be specifically helpful to your situation. We understand that recovery is a process that can take its toll on not only the patient but their support systems as well. To alleviate some of the pressure, we encourage you to seek help from rehabilitative professionals, Speech-language pathologists being an ideal option, to make this process as successful as possible. 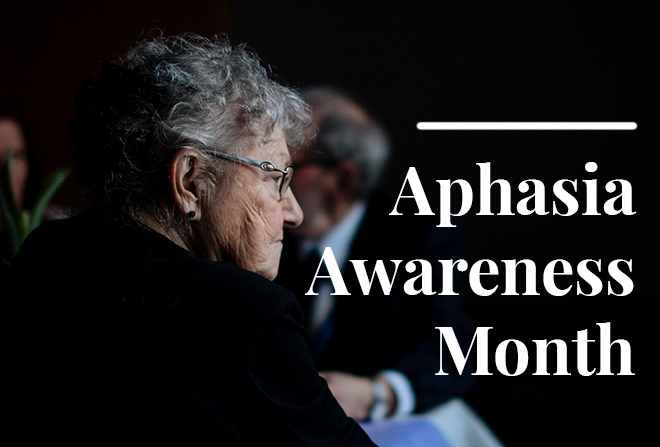 June is National Aphasia Awareness Month, and, because aphasia is something the team here at Utah Valley Specialty Hospital encounters frequently, we feel very strongly about spreading awareness of this condition. We use our interdisciplinary approach to care to provide a comprehensive experience that is efficient and complete. By assigning a team of specialists in different rehabilitation disciplines, we can ensure that a patient’s stay is quick and efficient, but also thoroughly attended to, so that no stones are left unturned. Because of the frustrating disconnect between intention and actual communication, we know how important it is to be compassionate. The team here recognizes its responsibility to both the emotional and physical care of our patients. 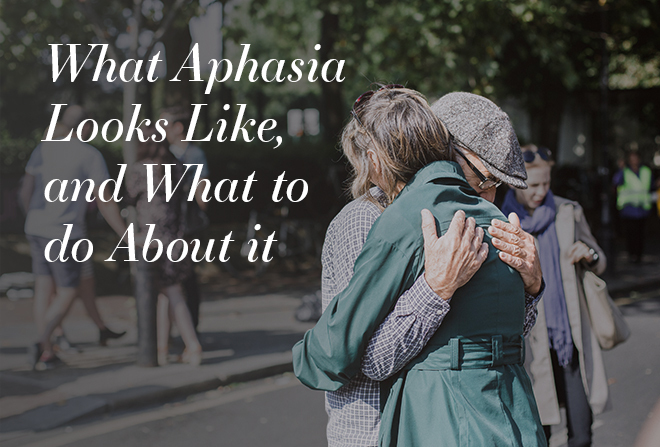 Aphasia is a frustrating and devastating condition that we see on a regular basis, and we feel that it deserves as much awareness as it can get. For more information, resources, and support for aphasia patients and their families, please visit the National Aphasia Association’s website. If you or someone you know is struggling with aphasia, or if you’re simply exploring your options, please contact us. We can promise expertise, empathy, and compassion that can be heard in the testimonials of those who have worked with us previously. 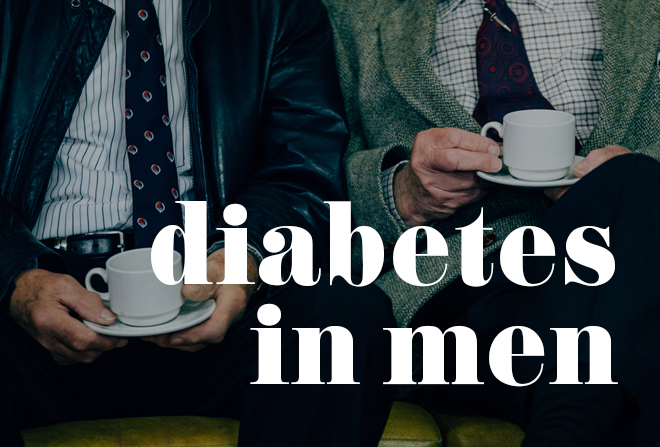 There’s no better time than Men’s Health Month to discuss an issue that is unfortunately on the rise for men – diabetes. In fact, one of the biggest jumps in type 2 diabetes was among men, and the risk for diabetes usually increases with age. But a lack of understanding and education about the disease is a significant barrier when it comes to good health. When you have diabetes, your body can’t properly control blood glucose. Food is normally broken down into glucose, a form of sugar, which is then released into the blood. Insulin, a hormone produced by the pancreas, stimulates cells to use glucose for energy. In type 1 diabetes, the immune system mistakenly attacks cells in the pancreas that produce insulin. Type 2 diabetes occurs when tissues in the body become resistant to the effects of insulin. Eventually, blood sugar levels begin to climb. High glucose levels in the blood cause nerve damage, as well as damage to blood vessels. In turn, this damage can lead to heart and kidney disease, stroke, gum infections, blindness, as well as issues like erectile dysfunction and sleep apnea. Moreover, the death rate from heart disease is much higher for men who have diabetes, while amputation rates due to diabetes-related issues are higher for men than women. Leading a sedentary lifestyle with little activity. Studies show that overweight people improve their blood sugar control when they become active. Having a diet that is high in refined carbohydrates and sugar and low in fiber and whole grains. Having a history of type 2 diabetes in your immediate family, such as a mother, father, sister or brother. Those with an increased risk of type 2 diabetes also includes African-Americans, Hispanics, American Indians, Native Alaskans, Asian Americans and Pacific Islanders. Aging – because the body becomes less tolerant of sugars as you get older. People who have metabolic syndrome, which is a group of problems related to cholesterol. What’s scary is that an estimated 7 million people in the United States don’t know that they have diabetes. Meanwhile, millions of people have elevated blood sugars that aren’t yet high enough to be diagnosed as diabetes, but are considered to have prediabetes and are at greater risk for diabetes in the future. However, doctors can easily check for diabetes through blood tests that measure blood sugar levels. Diabetes clearly is a disease with serious health implications, but the good news is that the vast majority of cases of type 2 diabetes could be prevented or significantly delayed through a combination of exercise and healthy eating. According to the National Institute of Diabetes and Digestive and Kidney Diseases, losing a modest amount of weight (10 to 15 pounds) can help prevent or delay type 2 diabetes if you have prediabetes. Cells in the muscles, liver, and fat tissue become resistant to insulin when you’re carrying excess weight. It’s recommended that you build up to 30 minutes of activity a day, five days a week. Experts also say that a healthy diet that emphasizes whole grains, fruits, and vegetables – with small amounts of sugar and carbohydrates – can prevent or delay the onset of type 2 diabetes. In many cases, lifestyle changes like the ones listed above can keep diabetes under control. Many people, however, need to take oral medications that lower blood sugar levels. When those aren’t effective, insulin injections (or insulin that’s inhaled) may be necessary, sometimes in conjunction with oral medication. Diabetes treatment has improved over the years, but controlling it still remains a challenge. Everyone deals with some stress, and we can sometimes shrug it off as just being part of day-to-day living. 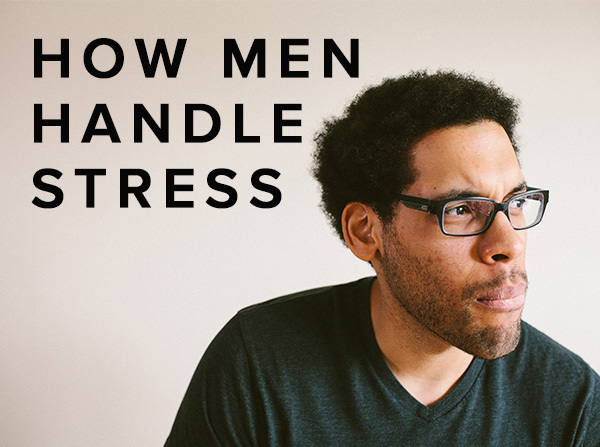 But dealing with too much stress has become a serious issue for a lot of men, who can experience several serious health issues as a result. Here’s a look at the dangers of stress, but also healthy ways to deal with it. And a variety of other issues, such as insomnia, depression, and fatigue. The good news is that there are plenty of ways to deal with the natural responses of stress. Your mental outlook is part of it, but so are things you can do physically that will help relieve stress and prevent it from becoming a hazard to your health. There’s not much that exercise won’t cure, and that certainly applies to stress. Exercise releases endorphins into the body that can give you a sense of ease and contentment, plus it removes you from the place/situation of stress and worry. Moreover, studies have shown that people who exercise regularly are less likely to develop an anxiety disorder within the next five years. And that’s not to mention the positive effects exercise has on your physical health. Some things, like bad weather, can cause stress, but they’re things that you have no control over. Accept the things you can’t change but look for ways to make the best of your circumstances. Spend a rainy day reading, or go outside and play in the snow like you did as a kid. Determine your most important tasks of the day and tackle those first. Those are usually the things that cause the most stress, and saving them for later, when you may not be as physically or mentally sharp as you were earlier in the day, can create undue stress. When you continually treat stress with the over-serious attitude, chances are you’re only going to make it worse. It’s OK to laugh it off instead of getting defensive. You’ll ease anxiety and potentially defuse the situation. Recent studies show that men’s stress levels rise significantly in situations such as traffic jams. If possible, figure out different routes, or time your driving to avoid rush hour. Similarly, shop at times when stores are less crowded and spend less time with people who aggravate you. Stress is usually a consequence when you over-schedule yourself or have a hard time saying no. Only take on what you can handle, and always give yourself time to finish the things you’ve promised to get done. A sure way to build stress is to do nothing about it. Deal directly, and quickly, with the cause of your tension. If you’re having problems at work, talk to your boss about possible solutions. If you have a noisy neighbor, talk to them rather than simmering in your stress. Meditation is beneficial in so many ways, not the least of which is the positive affect it has on dealing with stress. Try to spend 15 to 20 minutes a day in contemplation to help clear your mind. Yoga, tai chi, and contemplative prayer are other great ways to cut the tension. Do something nice for yourself if you finish a major project or meet a personal goal. No matter what you choose, it’s important to celebrate before moving on to the next big task. Having a negative outlook can turn minor annoyances into major ones. Try to always look at the sunny side of things instead.